Solight Design has raised over $100k in funding on Indiegogo for their latest solar innovation, the QWNN, and have committed to donating a solar light for every QWNN ordered. The elegantly designed QWNN, is perfect for life on or off-the-grid, providing light + power anytime, anywhere, while offering clean and sustainable energy. Having raised over $100,000, (466% of their initial funding goal), Solight Design has extended their successful crowdfunding campaign for the QWNN, a portable solar lantern and mobile charger until December 6, 2018. Solight Design has sold over 1,200 QWNNs and unlocked two of its stretch goals as rewards for their 879 backers. Through their NGO partner, Operation Blessing, 3,000 solar lights are already at ground zero in Indonesia. Solight Design has pledged to send an additional 1,200 solar lights from their Indiegogo campaign. The Company’s social mission has impacted over 600,000 lives worldwide and have played an active role in disaster relief efforts in Puerto Rico, Haiti, Syria, and throughout Africa where light is desperately needed. The elegantly designed QWNN, is perfect for life on or off-the-grid, providing light + power anytime, anywhere, while offering clean and sustainable energy. It features a built-in 4000 mAh rechargeable power-bank and fully recharges via sunlight in eight hours or through a micro-USB port in three hours. It also features six light modes, ranging from 45 to 320 lumens for up to 48 hours of continuous light. The QWNN is made of military-grade, PVC-free, UV coated sailcloth and engineered to be durable, rip-proof and tear-proof. With two built-in magnets, as well as two heavy-duty elastic handles, this versatile light can be attached or hung just about anywhere. Solight Design sells and distributes solar-powered innovation for lighting and personal power device products around the world. 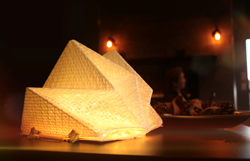 Their products are designed using origami principles to deliver lightweight, pack-flat, sustainable, unique solar lights and power devices. Solight products are engineered with recyclable materials to create the most durable and zero carbon products on the market. For more information about Solight Design, visit https://solight-design.com/ or visit their Indiegogo campaign, pr.go2.fund/qwnn.